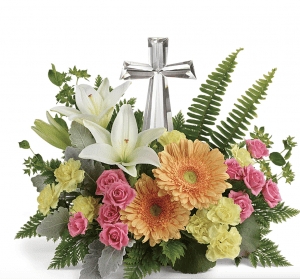 Easter is just a couple of weeks away, so now is the time to order your Easter baskets, Easter centerpieces, and Easter lilies for your Easter celebration and as gifts for other special people in our life. This spring bouquet adds a festive and spiritual touch to the Easter table with a keepsake crystal cross. There are pink spray roses, white Asiatic lilies, light orange gerberas, and yellow miniature carnations as well as bupleurum, dusty miller, galax leaves, sword fern, and leatherleaf fern. This is a bright and charming spring bouquet idea for the Easter table. 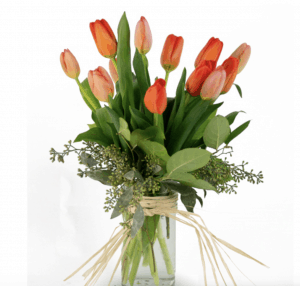 It features 12 tulips in a cylinder vase with seeded eucalyptus. The vase is tied with a raffia ribbon for a rustic touch. This fun centerpiece for Easter features fresh ornamental kale, blue hydrangea, and yellow tulips with a keepsake white ceramic bunny. 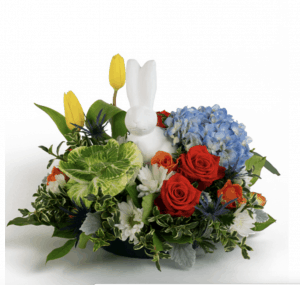 This spring arrangement of flowers makes an ideal Easter centerpiece or Easter gift. It has yellow hydrangea as well as tulips and daffodils in a glass cylinder vase that is topped with a sparkle bunny pick. This Easter vase arrangement is filled with roses, tulips, and hydrangea. Enjoy this green vase that displays green hydrangea, pink gerbera daisies, and yellow tulips for Easter. Celebrate spring and Easter with this fresh centerpiece that includes Monte Casino, coral roses, and peach gerbera daisies arranged in a glass vase. An iridescent aqua blue glass cylinder vase holds lavender roses, purple tulips, lavender alstroemeria, lavender miniature carnations, purple daisy spray chrysanthemums, dusty miller, seeded eucalyptus, sword fern, and lemon leaf. Place your order for Easter today at our Rochester flower shop or through our website!